There is a lightsaber in my room (and no that’s not an innuendo), I’m talking a Star Wars toy from Toys “R” Us that was gifted to me from Cyclops. Why did he buy us a lightsaber you ask? Well duh, because we attended the John Williams concert at the Hollywood Bowl on Saturday night…I thought that was obvious. Also in attendance (but with much better seats) were Ashley and Spike. There are so many iconic songs and themes that you instantly know thanks to John Williams. 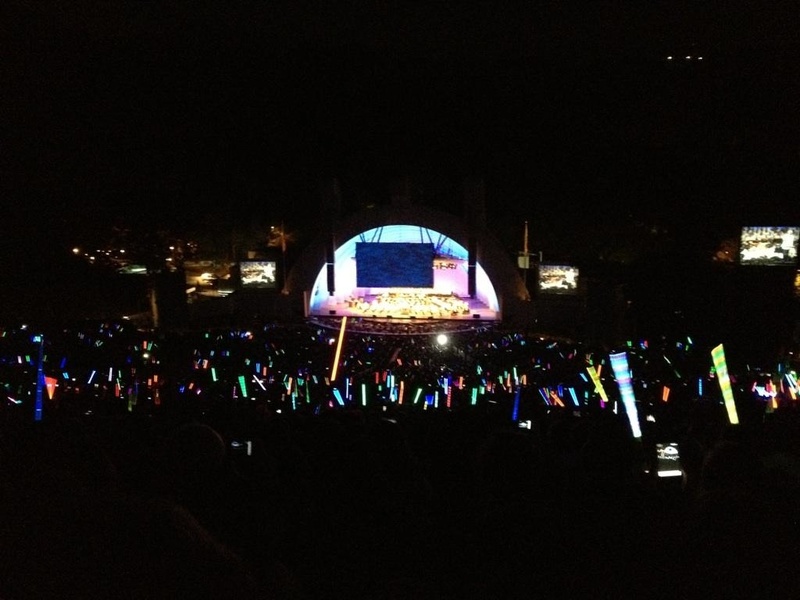 At his concerts one of the main events is when he plays anything from Star Wars, beacause fans whip out their lightsabers and conduct right along with him. Check out the picture above that gives you a sense of how cool this is to experience. Because he has so many great works, every year he tries to narrow down a few points he has to hit. This year, Mr. Williams focused on the Olympics with amazing music and a great montage of the London games, he played some of his newer compositions from Tin Tin, made the crowds happy with some Star Wars and the best of all (with the consent of Steven Spielberg) played the last reel of E.T. and gave us a live soundtrack in honor of the film’s 30th anniversary. This rendition made me really want to go back and watch the entire film, and the music going along with the film was amazing! Thank you Mr. Williams, at the age of 80 (I’m impressed) for once again giving the audience a great show and helping us all remember how music makes it fun to go to the movies. Oh and of course the night ended with both Cyclops and Spike showing off their sweet nunchuck skills (oh I mean lightsaber skills), and making both Ashley and I walk away from them quickly in embarrassment.